Heat oven to 350°F. Lightly grease 13x9-inch pan or 12-inch pizza pan. Unroll dough in pan; starting at center, press out dough with hands. Bake 15 to 20 minutes or until light golden brown. In 10-inch skillet, heat oil over medium-high heat until hot. Add chicken, onions, bell pepper, garlic, salt, coriander, cumin seed, gingerroot, turmeric, red pepper, cinnamon and cloves. Cook and stir 6 to 8 minutes or until chicken is no longer pink and onions are tender. Add tomato and peas; cook and stir about 3 minutes or until tomato is soft. 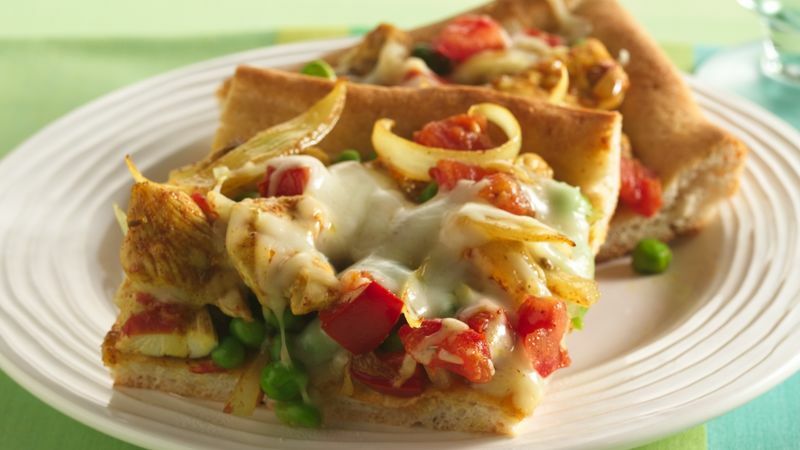 Spread chicken mixture over partially baked crust; sprinkle with cheese. Bake 17 to 22 minutes longer or until edges of crust are golden brown and cheese is melted. Let stand 10 minutes before serving. Make the pizza as spicy or mild as you like by increasing or decreasing the cayenne pepper.